"TELLING THE TRUTH IS NOT ANTISEMITIC. AM I RIGHT?" "THERE IS NOTHING MORE FRIGHTENING THAN ACTIVE IGNORANCE." The following sections contain brief excerpts from articles (over 1,670 so far) with links to the original online sources. If any links are broken, the original source has changed it; simply search the archive at the host organization (its address is viewable in the link at your URL address line). A few media sites, however, charge a fee for access to their articles after a few days. (Also, if a host web site uses a design structure called "frames," a direct link from here to the article isn't possible. Again, the host site's archives must be negotiated). Even if an article has been taken off the Internet since it was posted here, it can often be found by doing a google.com search, using a phrase from the article, finding the correct result, and then clicking the "cached" selection. [Other ways to find articles: from a correspondent]. We believe this to be the most extensive investigation anywhere into this subject. This site exists for non-profit educational purposes only. Its purpose is to elicit public discussion about the issues above. It is against all forms of bigotry. Criticizing the wealthiest ethnic group in America and any expression of its ethnocentrism, in-group solidarity, racism, unethical behavior, dual moral standards, political influence, dedication to a foreign nation, and exertion of power is not bigotry. It is one of our most elemental rights in a free society: to expose the bias, hypocrisy and injustice of influential power elites that effect all our lives. 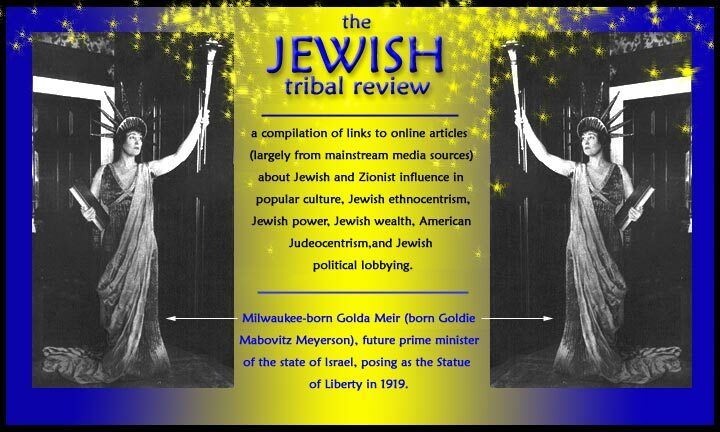 (The Jewish Tribal Review has been defamed by a web site called "The Hate Directory" as an example of "hate." That defamation is fraud. Read our email exchanges with that Hate site's proprietor and decide for yourself which web site -- that one or this one -- holds the higher moral ground). COMPLETE GUIDE TO PALESTINIAN WEBSITES. IS ISRAEL REALLY AMERICA'S FRIEND? "Communal responsibility is based on the fact that each of us is born into a community and shares its history, memories, identities, achievements, and failures. We are not simply human beings who can retreat behind a Rawlsian 'veil of ignorance,' secure in our universal rights and historical innocence. We are also members of specific families and communities ... We are all coresponsible for that which our community has perpetrated or condoned, for both sins of commission and omission." (All e-mails with an attachment will be deleted unopened).